Ideal Kitchen Monitor is a highly configurable display ordering software, which can be used in Quick Service, Drive Thru and Restaurant environments. 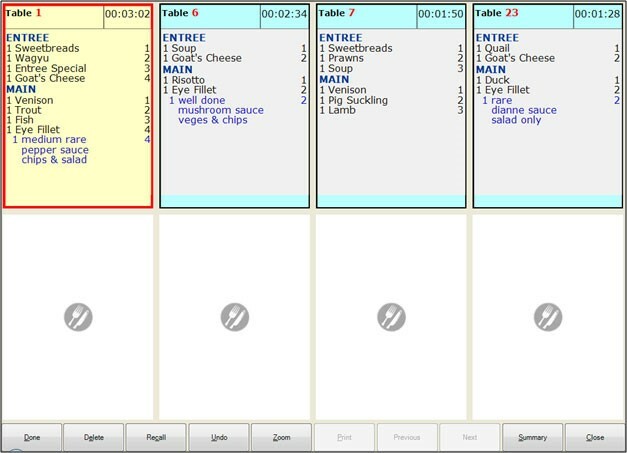 Takeaway orders can show the customer’s name or phone number and the Table Orders can be displayed in a different colour to a take away order, and you can set a visual alert colour to easily identify which orders are taking too long to prepare! The main benefit of a kitchen monitor system over kitchen printers is the ability to summarize all the orders together. This helps the chef to quickly total similar items without having to read through all the individual orders. Multiple monitors can be networked together in a Master/Slave configuration with the ability to delete orders from the Master Monitor for all monitors, or delete orders individually from each monitor.